This Thursday, the University of Wisconsin-Madison welcomed 25 young African leaders to campus for the six-week Mandela Washington Fellowship, a program sponsored by the U.S. Department of State. Doctors, journalists, government officials, lawyers and activists, the Fellows hail from 16 countries across the African continent. The African Studies Program has released the names and biographies of UW-Madison’s third cohort of Mandela Washington Fellows. These 25 Fellows are among 700 at institutions across the United States participating in the academic and leadership institute. UW-Madison’s Fellows will spend the next six weeks training and collaborating with Wisconsin’s top practitioners and scholars in the field of public management. This year more than ever, UW-Madison’s programming will feature opportunities for Fellows to share their expertise with the campus and community. Weekly Expert Exchange roundtables will give Fellows and local leaders the chance to discuss realities and solutions to global challenges. Topics of discussion will range from human rights monitoring to maternal welfare to the role of the private sector in public services. Indeed, this year’s Fellows boast a diverse breadth of experience. After a childhood battle with a benign brain tumor, Ugandan Fellow Rose Mary Nakame realized the importance of healthcare access in low-income communities. She founded REMI East Africa, an organization that has trained more than 550 female nursing students to increase access to quality healthcare in Uganda. Last year, Rose lobbied the Parliamentary Health Subcommittee to increase Uganda’s national health financing from 1.5 to 1.8 billion Ugandan shillings. South African Fellow Sibonelo Benson Mchunu works at the South African Human Rights Commission. As an Associate Compliance Officer, he promotes the constitutional right of access to information. A researcher by training, Sibonelo also drafts research reports on developments affecting the exercise of human rights by the National Parliament and the Office of the United Nations High Commissioner for Human Rights. Shaban Senyange, a journalist from Uganda, paired his dedication to environmental conservation with his passion for travel and media to create the TV show “ECO-ZONE.” Shaban travels around Uganda to showcase the country known as “the pearl of Africa,” and uses his travel show to raise awareness about environmental and wildlife conservation and to advocate for local communities affected by eco-tourism. In addition to sharing their expertise in Expert Exchange roundtables, Fellows will have the chance to interact with the campus and community through academic trainings and community service. The Global Health Institute, the Nelson Institute for Environmental Studies, the La Follette School of Public Affairs, the Office of Quality Improvement, the Law School and the School of Education have each partnered with the African Studies Program to develop academic curriculum. This year’s Fellows will also serve with the Lussier Community Education Center, The Bubbler, Gigi’s Playhouse, Goodman Community Center and the UW-Madison Arboretum. 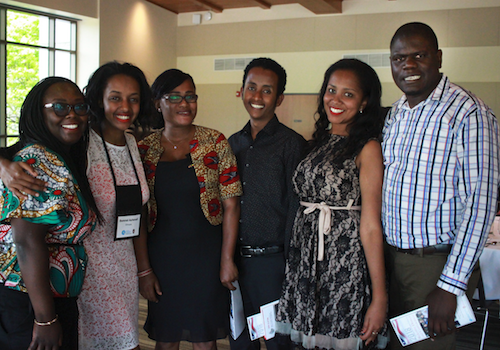 2018 Fellow Borah Burhegeya looks forward to “an opportunity for exposure and interaction with people from different walks of life.” She hopes that she can learn “best practices and lessons” from Wisconsin practitioners to bring back to her home country of the Democratic Republic of the Congo. Fellows’ enthusiasm is not limited to the classroom. Liswaniso Kabwela of Zambia says she is most excited to experience Madison’s food scene, including the weekly farmer’s market. “I really want to soak in the Madison lifestyle,” she said. The Mandela Washington Fellowship for Young African Leaders is a program of the U.S. Department of State and administered by IREX. For more information about the Mandela Washington Fellowship, visit yali.state.gov/mwf and join the conversation at #YALI2018.